As one of the oldest colleges in the region, Shree Manibhai Virani and Smt. Navalben Virani Science College has attained eminence above every seat of learning, and won the praises of the academicians, patrons, philanthropists, bureaucrats, elected representatives of the state and men of wisdom from different beliefs by virtue of its antiquity, curriculum, doctrine and privileges. Till 1960, the available academic facilities in the Saurashtra region were sparse which persuaded Sarvoday Kelavani Samaj, Rajkot with righteous endeavors to inaugurate Shree Manibhai Virani and Smt Navalben Virani Science College in June 1968 by offering Chemistry as a principal subject at UG level under the aegis and endowment of Virani Family. To start with, since 1968 the college is affiliated to Saurashtra University. From its early days, the college encountered many tumbling blocks of administration, management, fiscal crisis in its academic itinerary to provide learners with joyous experience. The late 20th century was said to be an era of academic conviction, scientific and technological revolution. Still the chronicle of growth and development was negligible. Hence almost after a decade of its establishment Yogi Divine Society of Haridham in Sokhda village of Baroda district which has been rendering its benevolent services took over Sarvoday Kelavani Samaj trust and started managing Shree Manibhai Virani and Smt Navalben Virani Science College since 1988 with its sanctified ideals of Samp – Suhradbhav – Ekta – Atmiyata. (Harmony – Brotherhood – Unity – Spirituality). H.D.H. Shree Hariprasad Swamiji as the president of Yogi Divine Society, Baroda has been providing the dynamic leadership, direction and divine blessings. Sarvoday Kelavani Samaj aspired to revitalize its intact academic set up and brought in paradigm changes with coordinated efforts of all its personnel under the versatile leadership of the trustee and Hon. 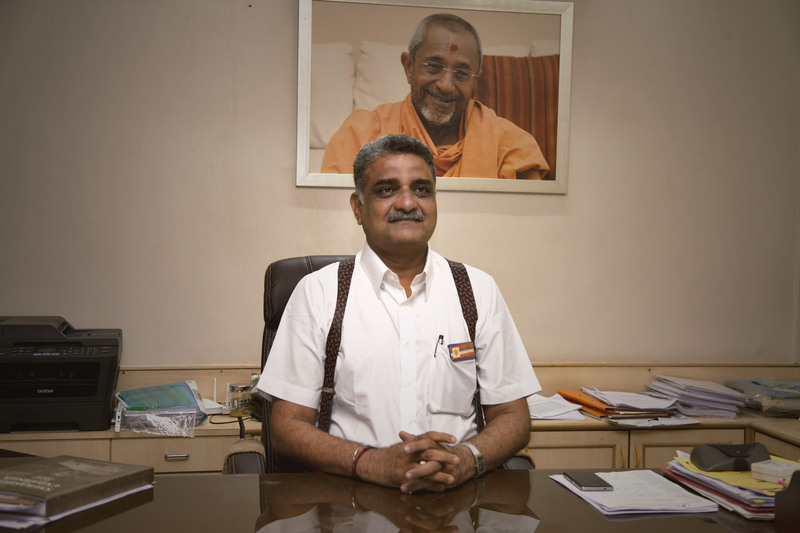 Secretary P. P. Tyagvallabh Swami. Additional programs were added in course of time to the science stream to grow and develop further under grant in aid and self financed mode. The college was included under 2(f) and 12 (B) of UGC in 1967 and 1989 respectively. These 25 years since 1988 onwards have been a period of academic escalation in Shree Manibhai Virani and Smt Navalben Virani Science College. The college has made thoughtful investment in creating and strengthening infrastructural facilities to facilitate teaching, learning and research. It is not just academic excellence that offer the college its special character but also it’s well thought out curricular system which underpins a culture of close academic supervision and careful personal support for the students. This fusion fosters the intense interdisciplinary approach that inspires much of the outstanding research and development suited to confronting many of the complex challenges thereby making Shree Manibhai Virani and Smt. Navalben Virani Science College a prominent learning place. This is reflective of its accreditation at ‘A’ grade by NAAC in the year 2007, status of ‘Star College’ by MST-DBT in the year2009-10 and status of ‘College with Potential for Excellence’ by UGC in the year 2010-11 and DST FIST programme in 2012-13. UGC has granted autonomous status in 2013 and the institution is awaiting the approval of Saurashtra University and State Government for the same. Each year, the college welcomes diverse and inquisitive learners at undergraduate, postgraduate and research level, from all over the state. The college has excelled in the field of education and is known today as one of the foremost centers of quality and professional education. For thousands of its students, it has been a gateway, to a professional life. To meet the demand of the changing and challenging global market, the college offers wide range of academic programs. The college’s learner centric approach in teaching-learning and research is consistently excels with appropriate facilities and resources to provide an intelligently designed environment and state of art learning conveniences. The Collegiate system fosters a sense of community between tutors and students as well as among other societal stakeholders. A strong professional base, a excellent system of curricular support and comprehensive psychosomatic support services supplements the core of teaching-learning. Selection of the proper educational institute decides the future of the student. One desires to select an institution that fits one’s academic, professional and personal goals. Shree Manibhai Virani and Smt. Navalben Virani Science College through its erudite faculty; wide range of academic programs; well stocked library; state of the art infrastructure, amenities, training and placement cell, disciplined environment, spiritual congregation gives a feel of a home away from home, and supportive campus community allows learners to accomplish and realize their “Goals” and “Dreams”. The college is synonymous to an Ashram set up with a sole endeavor and aim of developing the students intellectually, socially, emotionally and most important spiritually. The learners lead active lives outside the classroom and lab too. There are numerous activities centered on campus. This green campus is the perfect place for various forms of outdoor recreation. Students participate in our extensive intramural extracurricular activities round the year to compete at state and national level. The winners are felicitated by mementoes, trophies and certificates of excellence. The literary, artistic and creative mind set is also being nurtured through various co-curricular and extracurricular activities. The creative aspect of students is not only restricted to curricular and co-curricular or extracurricular activities but it spreads over application of learning in their real lives too. Is an Institution dedicated for science education offering UG – PG – Research Programs with very good enrollment and student profile also reflective of gender empowerment. Has been recognized by UGC under 2(f) & 12(B), affiliated to Saurashtra University, Rajkot. Is a Coeducational, Grant-in-aid under Government of Gujarat and is also offering some courses in SF mode as per University & State Government rules. Offers Courses in emerging thrust areas namely– Biotechnology, Microbiology, Biochemistry, Computer Application, Information Technology, Chemistry, Industrial Chemistry. Is actively engaged in research activities – Projects and Publications, guidance to Doctoral research. Has introduced of 3 UGC innovative PG programmes & several COPs. Moving towards excellence; Accredited at the “A” level by NAAC. Conferred with “Star College” by MST-DBT. Bestowed with “A College with Potential for Excellence – CPE” by UGC. Conferment of Autonomous Status by UGC in 2013 (approval from University and State Government is awaited). Has been availing of financial resources from UGC, DBT, DST for infrastructure, courses, research projects and student amenities. Has a provision of computerized library with ample of e-resources. Has a provision of good student support facilities and service, good laboratory facilities well equipped with high end machines and instruments. Has been achieving outstanding University results with top Ranks. Students have excelled in the field of sports, cultural, NCC and NSS activities. The institution believes in transparent administration, team work, value based scientific education and practices it in letter and spirit. It further believes in student empowerment, especially of women, staff empowerment and welfare measures. It has taken constructive steps to achieve them. In the process, the institution has implemented new policy initiative of UGC & DST / DBT as well as of Saurashtra University and Government of Gujarat. The institution has earned good social recognition for its commitment to quality Science and Technology education, disciplined environment, dedication, inculcation of value system and guidance towards skill development, employment and entrepreneurship. Thus we have contributed and continue to do so to realize the five core values. Inculcating Values among students by leading with examples. Promoting use of ICT and upcoming technologies in the field of study. With this full commitment to quality sustenance and enhancement, the institution hereby proposes to seek Reaccreditation by NAAC and hence the submission of Self Study Report (2nd Cycle). We are indebted to the benevolent management – (Chairperson, Secretary and members of Governing Council) for their all round support and encouragement to seek NAAC’s Reaccreditation. The institution acknowledges the efforts of IQAC, Steering Committee and the contribution and the support of all the faculty, students and alumni in this endeavor. The institution firmly believes in continuous improvement leading to excellence.